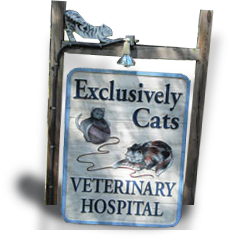 Exclusively Cats Veterinary Hospital is dedicated to providing the finest veterinary care in the best possible environment for our feline patients. Dr. Nancy Dunkle and our highly skilled staff share an affinity and kinship with cats and are specially trained to recognize and treat a wide range of feline health conditions. Feline wellness care—A focus on individualized, preventive care makes the life-long health of your cat a priority. General surgery—With a focus on general surgeries, we provide a safe and feline-friendly experience. Diagnostics—Special training in feline health and conditions affecting cats allows us to work with you to determine the best treatment plan. Dental services—A vital aspect of maintaining your cat’s health. Whether you have a new kitten, an adult cat, or a senior cat, Exclusively Cats Veterinary Hospital has the knowledge and experience to protect your feline’s health. In addition to providing exceptional medical services, we look after your cat’s total well-being. Our staff takes time to learn the temperament and preferences of your feline companion. Veterinary visits can be stressful for sensitive cats, so we do everything we can to make our patients feel at ease. If possible, try to get your cat used to car trips—make it not always about a trip to the vet. Spraying Feliway into the carrier will encourage your cat to explore it and help your cat to associate “positive thoughts” with the carrier. Keep a fresh catnip toy or sprinkle fresh catnip leaves in the carrier while it is out to let your cat get comfortable with it, and then put an additional fresh catnip toy or fresher catnip in the carrier for the car ride. Put clothing or a towel recently used by your cat’s favorite person inside the carrier just before transport. At least 30 minutes before putting your cat in the carrier, spray Feliway on the entrance. Drape a blanket over the carrier, which can make cats feel safer. And, above all, try to relax while putting your cat in the carrier. Cats are very sensitive to their person’s moods, so if you’re tense when putting your cat in the carrier, your cat will associate “tenseness” or “danger” with the carrier and do their best to get away. View more helpful information in this video on how to make the carrier a friend and not a foe. “ Our cats and I make more than a half-hour one-way drive to see her. She is worth every mile and then some. ” — Margaret M.